Small earpieces that fit snugly and come in pretty colors? If style and comfort is what you’re looking for, JLab’s JBuds J2 earphones seem to fit the bill perfectly. Compared to run-of-the-mill earphones which cramp your style and irritate the ears, JBuds J2 earpieces measure 0.37 inch in diameter and feature a straight aperture for a secure fit. Users are spoilt for choice in terms of color selection – the earphones come in onyx black, electric blue, orange citrus, and pink martini, amongst others. There is practically a color to match every MP3 player in the world. 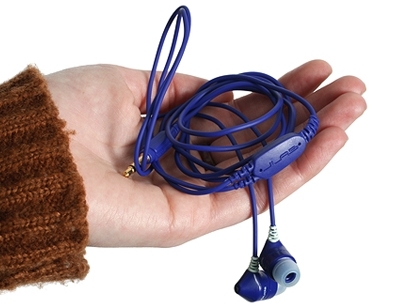 The color of the earphones runs from the cable to the tip of the earpieces. Retailing for $80 and offered at $30 in Amazon, JBuds J2, earphones, nevertheless, are not music for the ears for audio purists. While incorporating sound isolation and bass, the high notes lack clarity and detail while the booming bass causes a jumbled and cluttered effect on most songs. Sound isolation is discernible though not superb. As an alternative to the free earphones which come with your MP3, JBuds J2 earpieces add some style, comfort and quality to one’s listening experience.